May 12, 2008 – The Olympic Peninsula Wineries Association will offer a sneak peek at a number of upcoming releases during its annual Spring Barrel Tasting Tour, to take place Memorial Day Weekend, Saturday, May 24 through Monday, May 26. Seven member wineries located in Port Townsend, Sequim and Port Angeles will welcome visitors from 11 a.m. to 5 p.m. each day. The North Olympic Peninsula can be accessed in less than three hours drive from areas in north, south and central-eastside Puget Sound, making it an easy destination for a weekend getaway. Optional “reserve tickets” are available online or at any of the member wineries for $20.00, and entitle the holder to a special commemorative wine glass and complimentary tastings at all seven wineries. 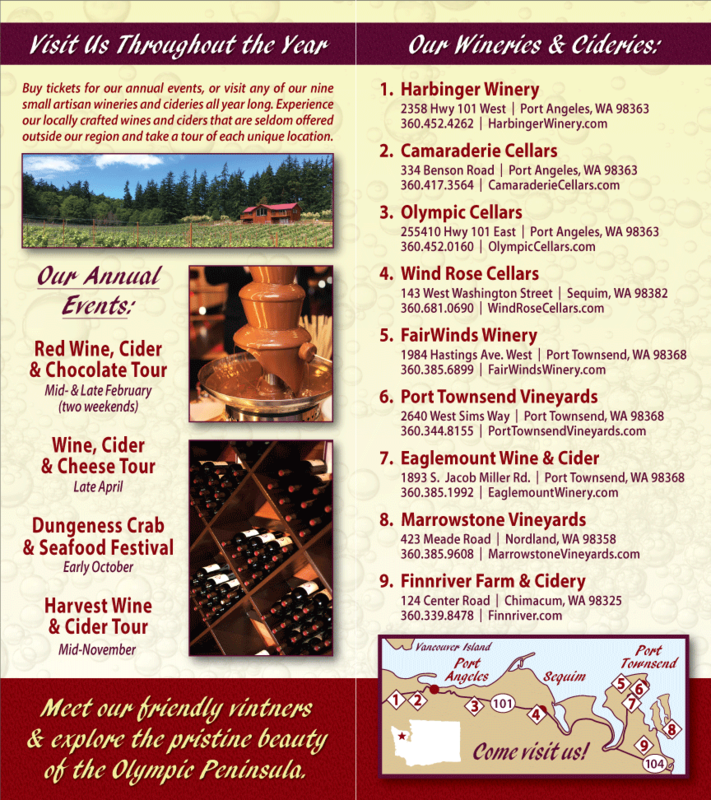 Visit www.olympicpeninsulawineries.org or call 800-785-5495 for further information. Camaraderie Cellars, Port Angeles: Barrel tasting will include some of Washington’s new rising stars as featured in a recent seminar at Taste Washington in Seattle, moderated by Winemaker Don Corson—Tempranillo from two different vineyards and Cabernet Franc. The tasting bar will showcase recent gold medal winning wines: the 2004 Cabernet Sauvignon, Cabernet Franc, Merlot, and Grâce (a Bordeaux-style blend). Special event pricing will be available to help visitors stock up on great reds and tasty whites for the summer. For more information call 360/417-3564 or visit www.camaraderiecellars.com. FairWinds Winery, Port Townsend: Visitors are invited to taste FairWinds’ “Port in Waiting,” (the next Port O’ Call to be bottled) straight from its oak barrel home, along with the recently released Fireweed Mead, 2004 Cabernet Sauvignon and other current releases. Continuous tours of the winery and winemaking operations will be conducted throughout each day, with a demonstration of wine barrel construction and explanation of the barrel’s role in the winemaking process. For more information call 360/385-6899 or visit www.fairwindswinery.com. Harbinger Winery, Port Angeles: In the flavor of a Northwest spring, Harbinger will sample its 2006 Cabernet Franc, which is slated for blending and bottling this summer. Visitors can taste the same wine aged in various types of oak to experience the wood’s impact. Several new releases will also be presented, including the 2007 Bone Dry Lemberger (the 2006 vintage was awarded “the best Rosé in Washington” by the Seattle Wine Awards Committee), the 2007 Rattlesnake Hills Viognier, and the much celebrated, locally grown Blackberry Bliss. Harbinger’s 2006 El Jefe, a Rhone blend of Grenache, Mourvedre and Syrah, will be released to the public over the long weekend. For further information call 360/452-4262 or visit www.harbingerwinery.com/index.html. Lost Mountain Winery, Sequim: Barrel sample the 2005 Merlot along with current releases. The 2007 Pinot Grigio and 2006 Distinguished Dago Red will be released over the weekend. Visitors can purchase specially selected half-case sampler packs at 10 percent off the regular price. For more information call 360/683-5229 or visit www.lostmountain.com. Olympic Cellars, Port Angeles: Gather in the cellar to sample two 2007 Cabernets Franc straight from the barrel – one from Bacchus Vineyard and one from Boushey Vineyard. Compare these up-and-coming vintages with the newly released 2005 and the 2004 library Cabernets Franc, and see how the elements associated with a particular year, as well as the terroir, can impact the vintage. Learn which seasonings pair well with different varieties of wine at the pairing stations. The Working Girl 5th Anniversary Wine – Gracefully Ageing Red – will be unveiled over the weekend. For more information call 360/452-0160; or visit www.olympiccellars.com. Sorensen Cellars, Port Townsend: Winemaker Richard Sorensen will introduce his 2004 Red Mountain Merlot, and offer some interesting tastes from the barrel. Light appetizers will be served, and special pricing will be offered throughout the weekend. For more information call 360/379-6416 or visit www.sorensencellars.com.